The Tenth House is commonly referred to as the House of Social Status. It is about the place we have attained in our social (or work/career) grouping and in society as a whole. Think status, the authority it conveys, and consequently, the role we take in our community. It also speaks to any promotions we receive, any fame we may have or will come to have and the types of business and social activities in which we partake. With respect to achievement, this house focuses on how we see ourselves and how the community as a whole sees us (and our efforts). Through this house, we work on manifesting ourselves. Vocation is important in the Tenth House. What role will we choose and how will we best fill it? How much do we want to achieve? Career, professional goals, ambition and motivation all come into play here. In a more practical context, employers and their rules are covered here, as are any other organizations (specifically the government) that have the ability to rule over us. Along with our life’s work comes the challenge of ruling over others, although there will generally be someone who lords over us. The prestige and social status we accrue by virtue of our careers and vocations can be seen, intangibly, in the form of ego gratification. How we manage this is addressed by the Tenth House. It may be most difficult to tire of financial rewards in our consumerist society; surprisingly, ego massage may grow old more quickly. The question of how we will manage these gifts, and the status that comes along with them, is important to this house. Will we use our power to truly help society, or will we be willful and reckless? Not all of us are cut out for grand scale social success or equipped to help society significantly. It’s also worth noting that many of our successes are achieved with the aid of society, not in a vacuum. This house is one marked by worldliness, and has an impact on your lasting legacy. We’re talking the enduring impact on society, by your actions and what you create. It could be monuments, books, buildings, theories or the shaping of young minds (as a teacher). It’s where you find the guiding signs toward achieving what you came here to do. You could call it the career destiny, how you make your mark. 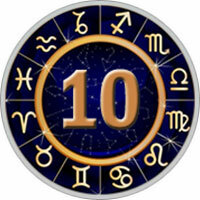 The Tenth House is ruled by Capricorn and the planet Saturn.